AUGUSTO NICCOLOA QUILIETTI was born in Castelvecchio Pascoli in the year 1870. He was the younger brother of EMILIO QUILIETTI. These two brothers left home in the year 1888 and followed their mother’s sister Maria Domenica Clementina Brucciani who had married Pietro Donati in Italy and who had came to Scotland in the 1880s. Their uncle Pietro was a master craftsman in the stucco trade and worked in the marble quarries of Carrera where he learned his trade. He started up a business at No. 5 Chambers Street, Edinburgh, and we know for certain that the Quilietti brothers joined him here and worked with him on their arrival in Scotland. Augusto found love with an Italian girl who was stunningly beautiful. She was Francesca Arpino. They married at the Church of the Sacred Heart Church, Lauriston, Edinburgh on 20th August 1893. The Arpino family ran a family business of confectioners at 85 Grassmarket, Edinburgh and they had a flat above the shop. It was here that the newly weds were to live at first until the birth of their daughter Angelina Quilietti who was born at 85 Grassmarket on 6th April the following year. They had a second daughter, Ermennia Quilietti, named after Augusto’s sister Ermenia who was at this time still living in Castelvecchio. Ermennia was to die the following year at 1 Ramsy’s Close, the Canongate, Edinburgh. 1899 was not a good year for the Quilietti family. Augusto lost his daughter and later in the year his brother Emilio. 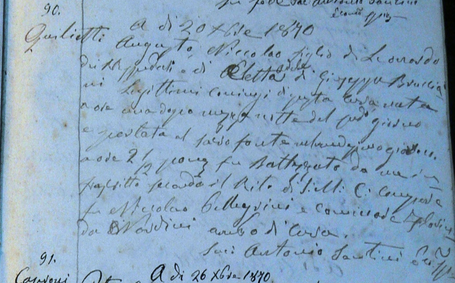 This was to have an adverse affect on Augusto who never really got over this as the two brothers were very close having left Italy together and having found a new home in Scotland. 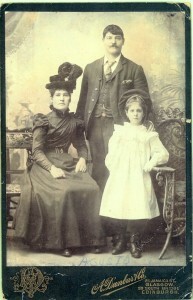 In the 1901 Scottish Cencus finds Augusto, Francesca and Angelina residing at 1 Ramsay’s Close, Canongate, Edinburgh. Residing with them at this time was a young Italian girl who was described as a ‘servant’. Augusto’s transgression into the confectionery and ice cream and catering business from the stucco trade was of course helped along by his new family. 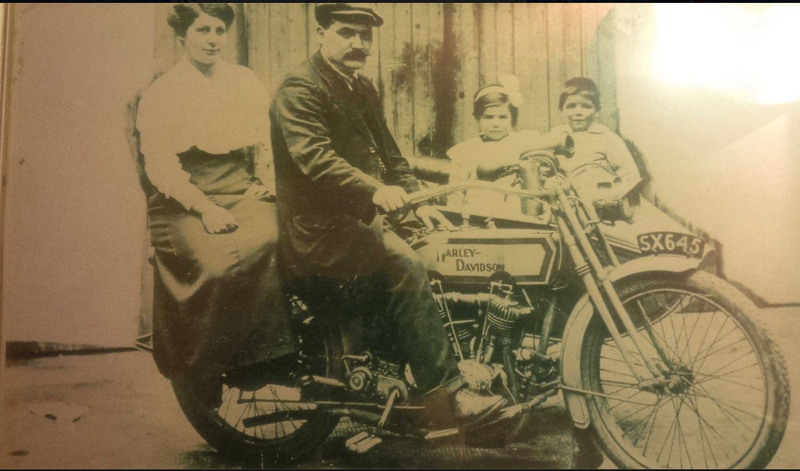 The Arpino family were by this time well established in the confectionery trade and made ice cream, tablets and chocolates. 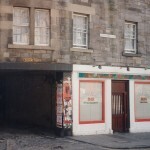 They also started to sell fish and chips and the shop at 89 Grassmarket is still a Chippi today. After Emilio died Giuseppe and Adolfo Quilietti along with Pietro Dante, their cousin and brother-in-law, visited him here in Scotland. They were photographed at a photographer’s studio on the South Bridge to mark the occassion. You can see the difference in Francesca here, how sad she looks. Three of the Quilietti brothers were here in Scotland at this time. 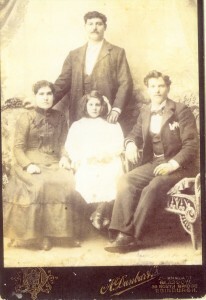 It would be the last time they were together as Augusto, who looked more like his own father than any of his siblings, was to die tragically in the year 1904 of typhoid fever. He died at 1 Ramsay’s Close, Canongate, Edinburgh on 13th May 1904 age 33 years. He was lain to rest in the Easter Road Cemetery, Section C. Lair 397. The stone has now gone registered as ‘missing’ by the Eastern Cemetery Administration. The stone was apparently taken away for non-payment of cemetery fees in the year 1983. After the death of Augusto his widow and daughter went to live in Paris where Francesca had close family. She gained employment at this time in the glass-manufacturing industry. During their stay in Paris Angelina Quilietti learned to speak fluent French. Some years later they returned to Edinburgh where Francesca married again to an Englishman whose profession was a butcher. He was called Wallace Bain. Francesca died in the year 1943 and is buried with her first husband Augusto Quilietti in the family plot in Easter Road Cemetery, Edinburgh. Angelina was to marry her cousin Giovanni Battista Arpino in the year 1911 in the same Church as her father and mother, the Church of the Sacred Heart in Lauriston, Edinburgh.